Carol Tompkins Design » Thank you Steve Jobs…. you changed my life! Thank you Steve Jobs…. you changed my life! As most people know by now, Steve Jobs has died. Steve Job brought passion and innovation to all of his products. His Apple computers, iPods, iPads, and iPhones changed how we work, listen to music, receive our information, and communicate with others. 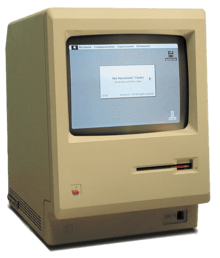 My first introduction to Steve Job’s creations was back in 1988 when I started working on a Mac SE. Prior to this, I wasn’t convinced that using a computer would speed up my work or help me be more creative. However, the ability to design with type and create layouts without creating marker comps changed all of this! The Mac gave me creative freedom and generally revolutionized how designers create artwork. From my Mac II to my newest MacBook Pro, I have loved Steve Job’s creations. His products are designed beautifully, are very user friendly and actually changed my perception about design.